Be sure you’re getting enough calcium. The best way – eat breakfast. 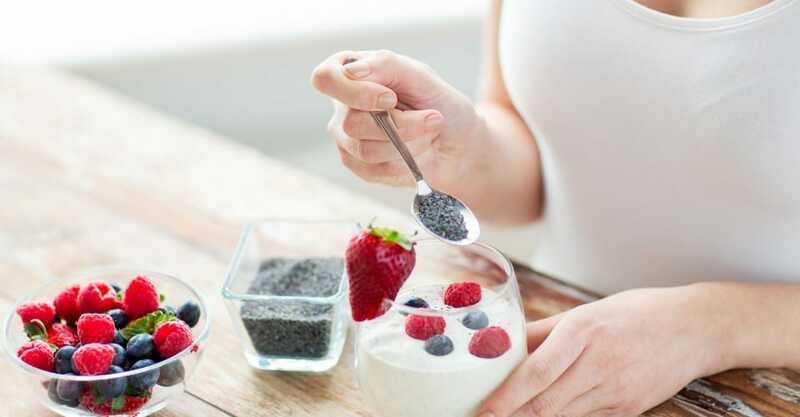 Research appearing in the Journal of the American College of Nutrition found that those who eat a breakfast including calcium are more likely to meet their necessary recommended daily calcium needs. Studies have found that adequate calcium intake, 1,200 to 1,500 mg daily (about three to four servings of high-calcium foods), reduces both physical and psychological symptoms of PMS, such as mood swings, depression and menstrual cramps. But the majority of women are not meeting these recommended goals. Choose calcium-rich dairy products, such as skim milk, yogurt or low-fat cheese. Not a dairy lover? Try soymilk, almonds, kale, tofu, canned salmon with bones, broccoli, spinach and canned or dried beans. A study published in the Journal of Clinical Endocrinology and Metabolism in 1998 reported that blood levels of vitamin D and calcium drop during the luteal phase (the part of the menstrual cycle right before menstruation). In this study, PMS symptoms were reduced by 48 percent in women who took 1,200 mg/day of calcium. Other studies also show that women with higher calcium intakes have less PMS than women who consume less calcium. “Oral magnesium, 360 mg daily, from the 15th day of the menstrual cycle to the onset of menses, significantly improved premenstrual pain and negative affect,” says Dr. Milosavljevic. Sources of magnesium include nuts, wheat germ, green leafy vegetables and bananas. According to Anne VanBeber, Ph.D., R.D., L.D., associate professor and chair of the department of nutritional sciences at Texas Christian University, research does show that having the proper fat in your diet could influence PMS symptoms. “Fats that promote production of the 1- and 3-series of prostaglandins help to decrease inflammatory responses, decrease pain and dilate blood vessels. Fatty acids that promote production of the 1-series of prostaglandins include gamma linolenic acid, and the 3-series of prostaglandins are made from the omega-3 fatty acids, such as linolenic acid, DHA and EPA. Fats that promote production of the 2-series of prostaglandins are inflammatory. They are made from omega-6 fatty acids (linoleic acid), which are converted to arachidonic acid. Arachidonic acid then produces the 2-series of prostaglandins, which are inflammatory. These prostaglandins also promote sodium retention, which could be involved in the bloating during PMS.” The diet should be rich in omega-3 fatty acids. This can be accomplished by eating walnuts, flax seed and flax oil, cold-water fish, and sea vegetables such as kelp. Vitamin E, 400 units per day, may be minimally effective for PMS, according to a 1987 study published in Reproductive #Health. Another recent study by researchers at Federal University of Pernambuco, Recife, Pernambuco, Brazil, also appearing in Reproductive Health, hypothesizes that a combination of vitamin E and essential fatty acids decreases PMS symptoms. Wheat germ and nuts are good sources of vitamin E. Other foods high in vitamin E include vegetable oils, such as safflower oil, and whole-grain cereals and breads. Researchers reporting in the Korean Journal of Community Nutrition compared the incidence and severity of premenstrual syndrome in normal and overweight or obese female college students and found that the symptoms of “pain” and “behavioral change” were significantly higher among the overweight or obese subjects than in those of normal weight. Yet another reason to maintain a healthy weight. Researchers reporting in the American Journal of Clinical Nutrition found a significantly lower risk of PMS in women with high intakes of thiamine and riboflavin from food sources only. Thiamine food sources include sunflower seeds, beans, flax seeds and lentils. Riboflavin sources include low-fat yogurt, spinach, shitake mushrooms, soybeans and low-fat milk. A 1999 British Medical Journal article states that no more than 100 mg of vitamin B6 should be taken for PMS symptoms. This study indicated that B6 helped reduce symptoms of depression, breast tenderness and bloating during PMS. The balance of estrogen and progesterone is related to the amount of B6 in the blood, and B6 deficiency is correlated with estrogen dominance, which might interfere with the normal excretion of sodium from the body and could, therefore, cause bloating. Vitamin B6 is reputed to be a PMS cure-all. However, Dr. Milosavljevic says that it has demonstrated only mild to moderate effectiveness in clinical trials for relieving PMS symptoms. If you choose to take a B6 supplement to alleviate your symptoms, be sure not to exceed a dose of 100 mg without a physician’s supervision, and take it during the last two weeks of the cycle. Or get your B6 from foods instead of supplements and avoid the potential neurological dangers of over-supplementation. Foods such as chickpeas, salmon, lean meats, potatoes, spinach, beans and bananas will help to ensure an adequate intake. Carbohydrates have been shown to increase a brain substance called serotonin, a neurotransmitter that controls mood, sleep and appetite and, when elevated, helps you to feel more relaxed and calm. So stay calm, and choose healthy carbs such as fruits, vegetables and 100 percent whole grains. A high-salt diet can increase fluid retention and bloating. Go easy on processed meats, fast foods, canned foods, chips and other snack foods. To add flavor, try various salt-free herbs and spices such garlic, pepper, lemon, basil, cumin, curry, paprika and others, rather than reaching for the salt shaker. Although that morning cup of java may be necessary to get your day going, excess caffeine may increase stress levels and exacerbate PMS symptoms such as headaches, anxiety and irritability. Many articles substantiate the thought that caffeine makes PMS worse; however, a recent study on this topic reported in The Internet Journal of Endocrinology found no difference in suffering between caffeine and non-caffeine users. To be on the safe side, try to limit yourself to one cup of coffee, or, better yet, drink tea, which has only about half as much caffeine. Also, be wary of other caffeine products such as colas, over-the-counter diet pills and some pain medications. Excess alcohol consumption can cause dehydration, moodiness and poor sleeping habits. Having a hangover may also increase cravings for fatty, salty foods. And, according to Milosavljevic, alcohol also lowers blood sugar, contributing to irritability, and is high in calories, altering metabolism. Physical activity reduces stress, which can improve your mood and prevent food cravings. Exercise may also improve self-esteem, prevent insomnia and decrease the pain of menstrual cramps. Shoot for 20 to 30 minutes of aerobic exercise (such as brisk walking, cycling or dancing), three to five times per week. Dr. Milosavljevic says that exercise may be no more than a placebo effect, but it is beneficial in general and can be recommended on that basis alone.